Panama Island Tour & Beach Trip Options: details, itinerary and prices for day trips and overnight excursions to the islands of Chiriqui's gulf. Learn how we will reach these paradisiacal islands and discover our repertoire of fun and relaxing sea water activities. 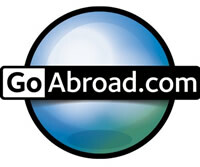 It's a great trip that couples or families vacationing in Panama shouldn't miss! Preparing the Perfect Island Boat Tour: where will we meet to start this tropical adventure? How do we get to the Chiriqui Gulf? What do I need to bring to really enjoy it? What to expect to bring back? Chiriqui National Marine Park: learn more about the location and characteristics of the protected waters and islands of this tropical treasure. If you want to spend several nights in the Chiriqui Gulf National Marine Park you might want to consider Isla Paridita's All Inclusive Private Island Getaway Resort. Whether you want to lie on the beach, snorkel a bit, swim in crystal clear waters or go wildlife watching underneath the rainforest canopy, there is something for everyone in this off-the-beaten-path destination! After a 1.5 hour drive from Boquete we hit the Pacific coast. Our super panga is waiting for us in the small fishing village of Boca Chica, just outside of David. Our licensed boat captain finalizes preparations and we all hop in and begin our boat tour through the mangrove estuary of Laguna de Chiriqui. It is very likely that at the end of this first leg of our journey we will encounter some dolphins, who will swim around our boat and playfully jump out of the water to our delight. 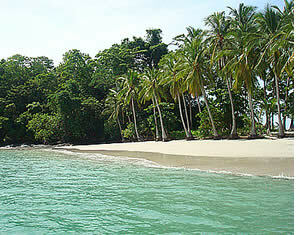 Very soon we will enter the protected waters and uninhabited islands of Chiriqui's Gulf National Marine Park. With more than 14,000 hectares (36,000 acres) of extensive coral reef, mangrove swamps and marine meadows, this protected area serves as a refuge for leatherback and hawksbill turtles, tiger-herons, large pelagic fish like white-tipped sharks, howler monkeys and scores of colorful exotic fish. Nature then gives us a magnificent display as we contemplate how the sea's colors change. The dark blue tones which surround the mangroves near the shore give way to shades of turquoise and emerald wrapping white-sanded beaches on idyllic islands lined with slender coconut palms. This tropical exhibit is complimented by picturesque rocky outcrops sprinkled across the gulf. Talk about beauty, you'll not want to leave! Afterwards we will pass the late morning and better part of the afternoon exploring, swimming, relaxing in a hammock, lunching and playing on the white sand beaches of one of Chiriqui Gulf's tropical islands. 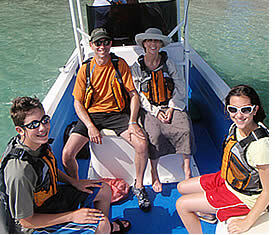 Snorkeling gear is provided to explore the surrounding waters. At certain times of the year, whales are also passing by. If we are lucky enough we'll see them "spouting around". The Islands of Gamez and Bolaños are our most popular destinations, although for those on a budget a closer trip to San José Island is offered. Your trip's final destination depends on weather and sea conditions. A major plus of this whole region is that the dry season tends to start earlier than in other parts of Panama, around November, and ends at about the same time, in May. The air out here is fresh and balmy, unlike the interior humid lowlands or the Caribbean. If you think that just one day on an uninhabited island in the Gulf of Chiriqui just isn't enough, we also offer this beach trip as an overnighter to make this the highlight of your Panama experience! Prices include: transportation to and from Boquete (to and from Caldera or David as well), boat trip, snorkeling gear, hammock setup, professional guides, snacks with fresh fruit and cold drinks at the island, and a cooler if you choose to bring additional refreshments, and a meal of the day lunch back in Boca Chica (fresh fish or chicken, or upgrade to lobster for $5 more). For the overnight boat tour option all camping gear, equipment, and meals are also provided. 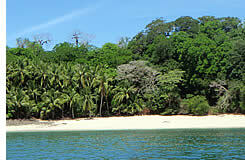 A minimum of 6 persons is required for any boat tour to the islands of Chiriqui's Gulf. 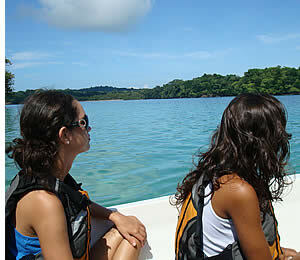 Who can join our Panama Island Tours in Chiriqui's Gulf? Everybody is invited to join our Panama boat tours! No specific fitness level or special skills are required! Come and have the time of your life! Where does this Island Tour start? You can come to our offices in Central Avenue Boquete at 6 a.m. or we can pick you up at your hotel in Boquete, Caldera or David. So, what needs to be done to make this beach trip happen? And what do I need to bring with me on the day of my Panama Island Tour? Many local fisherman are also out there looking for their day's catch so we may as well make the most out of it and get some fresh lobster, crab, shrimp or one of the many fish that they might have already caught. Nothing like fresh seafood for a nice dinner back in Boquete! Sport fishing in the Chiriqui Gulf beyond the Marine National Park is legendary around Ladrones, Secas and Contreras Islands. Islas Secas is a cluster of 16 private islands that are part of a luxury ecolodge. Another way to access the Golfo de Chiriqui National Park is through the little town of Pedregal. You just have to drive pass the Enrique Malek airport for about 15 kms. The boat journey from here though is considerably longer (1.5 hours) to get to the Chiriqui Gulf National Park compared to the 30 minute boat ride from Boca Chica. Fancy a Sun and Sandy Weekend? Plenty islands and beaches nearby! Contact us! Amongst the lush island vegetation and sandy beaches reside three species of monkey, four species of turtle, and a plethora of bird species. Underwater, the reefs are rich with colourful marine life, and humpback whales, hammerhead sharks, dolphins and schools of giant manta rays are frequently observed. Marine turtles, in particular the leatherback and hawksbill, nest on the beaches in the park. The most common reptile is the green iguana especially on Bolaños Island, and the most common amphibian is the green-black frog. The bare-throated tiger-heron and the yellow warbler can be found in the mangroves of Parida and Paridita Island. You'll also find pale-vented pigeon, red-lored Amazon, brown-throated parakeet and the orange-chinned parakeet. On the larger islands there are howler monkeys, raccoons and paca. The coral reefs and marine meadows are the particular strength of this national park. In the coral reefs, which include coral Porites lobata and fire coral, are the home to fish like the king angelfish, bicolor parrotfish, and white-tipped shark.